See part 1 and part 2 to this post here. Three balls done and four to go! 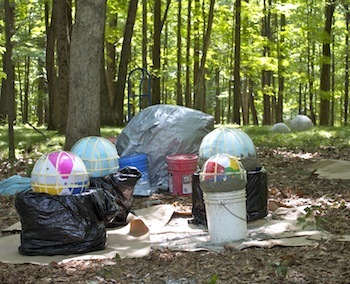 As we approached the last four balls for our sculpture we applied some learned lessons. We knew there was a lot of waiting time between applications of concrete because of the set time. 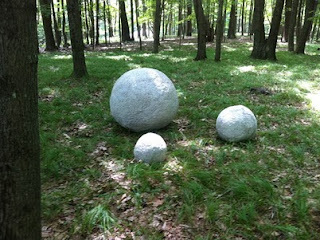 We also had learned that the 30 minute set time of the Quickrete was plenty to work on multiple balls at once. We decided to work on 4 at once. This time we used both beach balls but also the very large children's bouncy balls. They had some 24" chilldren's balls at Walmart for $2.50. They also worked well as an armature. 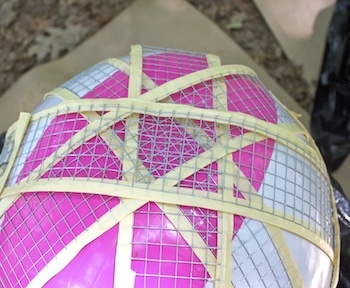 We also taped both edges of the hardware cloth to prevent punctures, used the 1/2" mesh, and applied the hardware cloth in complete circles- no partial pieces. We also didn't try to cover all areas. In mixing concrete we mixed full bags as we started the ball and then decreased to 1/2 and 1/3 bags as we finished them off. 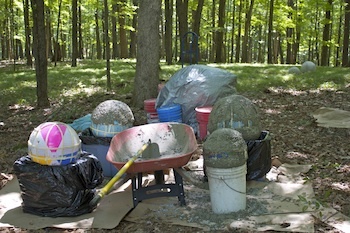 In the initial application we could easily apply a full bag before the concrete started to set. We worked without the collars and just applied the cement to the top, let it set and then rotated it. It took about 6 rotations to cover the ball. It saved time to work on four balls at once. Each was placed in a five gallon bucket but the larger ones were also balanced in an 18 gal tupper tub. 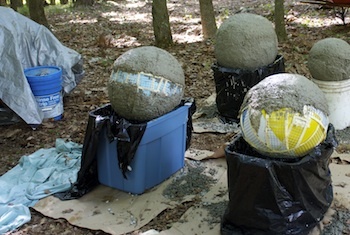 We had filled the bottoms with water to provide a heavy base that wouldn't tip as the balls got heavy. It was at the end that we learned all bags of concrete are not the same and we had some that seemed to have a much higher percentage of stone. We had trouble working this concrete and piles of it fell off. We purchased a bag of just plain mortar (no stones) and started adding cupfuls of that to our batches to create a better mixture. Next time we'll start that at the begining. The concrete with added mortar worked better, stuck better and gave us more control. Soon the balls will be ready to be uncovered. As a teaser we uncovered the biggest ball and rolled it into place. Hopefully later today we will add the four new ones.